A senior Russian MP has slammed the Kiev regime for issuing an arrest warrant for the former Ukrainian president and said the current leaders of the country could soon find themselves facing criminal prosecution. “Today Kiev is using Interpol to put a warrant out on [former Ukrainian President Viktor] Yanukovich. This is typical of totalitarian and undemocratic states, when a change in power leads to repression and criminal cases against former state officials,” the Chairman of the State Duma Committee for relations with the CIS bloc, Leonid Slutskiy, told the RIA Novosti news agency. “The system that is now being formed in Ukraine is inherent to dictatorships,” the MP claimed. “We all remember that Yanukovich was deposed as a result of a coup d’état. And the ongoing blatant repressionagainst the democratically elected president can have results that would be opposite to expectations, first of all for those who are currently in power,” Slutskiy said. 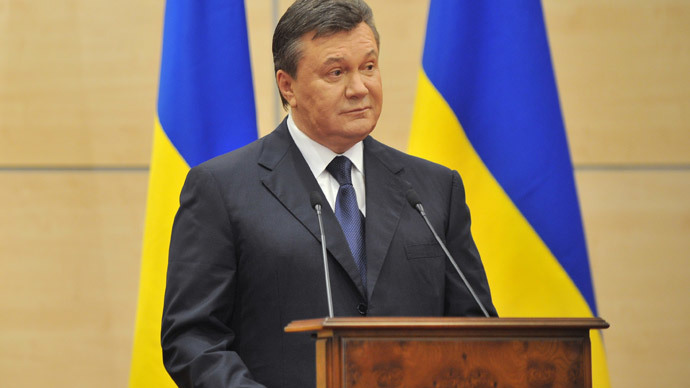 The warrant for Viktor Yanukovich was put on the Interpol website earlier this week. The charges listed include misuse of power and embezzlement of state property. Also this week Russian Prosecutor General Yuri Chaika said in an interview that his agency had not received any official requests from Ukrainian authorities concerning former President Viktor Yanukovich, adding that if such documents appear the reaction will be in line with Russian and international law. Viktor Yanukovich left Ukraine for Russia in February 2014, after violent riots in Kiev and other major cities in the country. The unrest was prompted by Yanukovich’s decision to ditch the agreement on Ukraine’s association with the EU, a move that would put into question established economic ties between Kiev and Moscow.